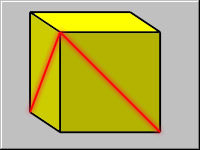 Can you say what angle is made by the two red lines drawn on two sides of the cube as shown in the illustration? There is the logical and elegant explanation that if you connect the two endpoints of the red lines in the diagram, you will get an equilateral triangle. If you turn the cube around, you will see each angle is exactly the same, and since the triangle is planar, it is equilateral. The angles are 60 degrees for an equilateral triangle. For those who can't imagine the above, I have enough knowledge about vector geometry to solve this. Making the intersection of the two lines the origin and each red line a vector, I can use the dot product to determine the angle. Solving, cos(theta)=.5 and theta=60 degrees.